Please read first my previous Ray Wilson review of his album “Makes me think of home”. 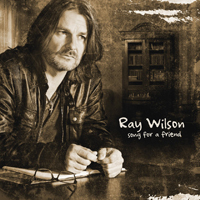 Ray Wilson released two albums this year that have both a slightly different atmosphere. If “Makes me think of home” is more a band album then “Song for a friend” is more a solo album with the acoustic guitar as main instrument. Personally I am very charmed by this wonderful acoustic album with great lyrics of the man with that great voice. On this wonderful album you can find the following tracks; “Old book on the shelf”, “Over my dead body”, “Cold light of day”, “Song for a friend”, “How long is too long”, “Not long till springtime”, “Backseat driving”, “Parallel souls”, “Tried and failed” and “High hopes”. It make not sense to review each track of this album separately. This is one of those great albums that has a consistent atmosphere and no weak points. It is lovely to relax while your are listening to this album after a day of hard work. With the tracks “Old book on the shelf” and “Over my dead body” this album has a very strong opening. Strong lyrics beautifully sung by a great voice and singer. You could say less is more if you listen to the delicate instrumentation. Just an acoustic guitar and sometimes a delicate keyboard orchestration. The slide guitar in “Cold light of day” gives the piece a country feel. The guitar solo on this track is played by Ali Fergusson. Title track “Song for a friend” is one of the gems of this wonderful album. “Not long till springtime” is also a beauty. I find that the lyrics of this album are exceptional and very strong. The last song “High hopes” is the longest track of the album. Beautiful melodies and a nice instrumental middle section that is delicately orchestrated. The guitar solo in the end is played by Uwe Metzler. What a beautiful album this is. The first time I listened to it I could not help myself to push the play button again after the last notes of “High hopes” had died away my living room. Immediately recognizing that this is an exceptional and beautiful album. If you like the other album that Ray Wilson released this year (“Makes me think of home”) you just have to buy this album also. It will not disappoint you. “Song for a friend” is a beautiful little gem that is very welcome while we are all living in this hectic and sometimes overwhelming world. Of course I don't have to tell you that I've really enjoyed listening to “Song for a friend”. Highly recommended!